This is a phtograph from the Society collection. But there seems to be an element of uncertainty about exactly what it is, and what it did. 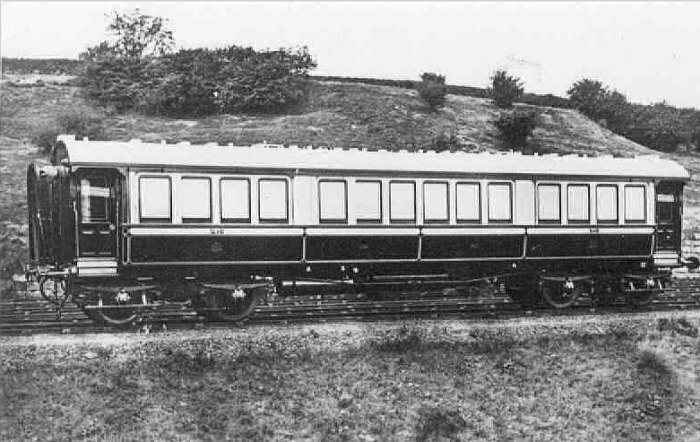 This is American Special kitchen car No.315 as shown in the carriage exhibition feature. Where it was taken I don't know. The scenery hints at somewhat wilder countryside than is encountered twixt Euston and Liverpool. Quite right. The doubt arose because I mixed up the image dimensions and stretched the image, making it look a lot longer than it really was. (I've fixed the image in the exhibition). But any thoughts where this was taken? The photo was taken at Wolverton, south of the Works on the west side, looking west. Several were taken here; see D Jenkinson's 'LNWR Carriages' plate 35 page 18, plate 147 on page 121 - also in Ted Talbot's 'LNWR Miscellany (1)' plate 52. The individual bushes in the background can be recognised!